There is only one man on this planet who could take down Leonardo DiCaprio’s cool, calm and collected demeanour, and that man is, of course, the President of the United States. 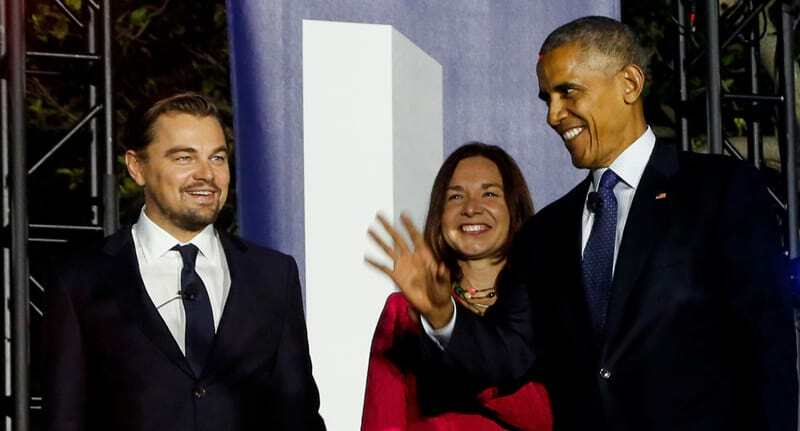 Yesterday, Barack Obama invited his good pal Leo to his backyard to promote his new film about climate change, Before The Flood, at South By South Lawn festival. After an hour or so, when it became clear the Planet Earth is fucked thanks to our aerosol overuse, the conversation turned to Elon Musk’s plan to colonise Mars. The reality of it is, if you’re a human living on this planet — which most of us are, yeah? As long as we haven’t signed up for the trip to Mars. I don’t want to know if anyone has, I think you’re crazy. When Leo admitted that he had actually signed up, a frazzled Hayhoe was quick to say that she didn’t actually think the Academy Award-winning actor was unhinged. Leo live streamed the comedic back and forth, which occurs at 37:30, on his Facebook page. Go forth and enjoy this joyful moment between two of the greatest men of our age. In the meantime, I’ll be signing up to this Mars Mission. Take me with you, Leo!